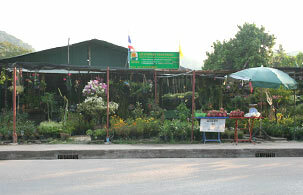 Suttichorn Landscape is managed by Khun Doungruthai Chumpornpun (Khun Peow), directly graduated from faculty of agricultural science in Horticulture field. She has over 10 year’s experience and is the gardener, landscape designer, planner of gardening and water systems that Phuketians are thinking of firstly. Suttichorn Landscape, a leader in the landscaping business, specializes in landscaping, gardening, water system for gardening, hardscape and maintenance committed to your budget. In addition, we are the leader of Bio-Farming business in a permanent agricultural way and nontoxic. Suttichorn Landscape has a big dragon fruit garden, the first and only one garden in Phuket that produces sweet and tasty fruits though the year. Apart from that, we also distribute dragon fruits both for retail and wholesale including pure dragon fruit breed. Importantly, we can correctly plan dragon fruit gardening system and can ensure that the dragon fruit garden meets standard and quality. Suttichorn Landscape distributes plants, flowers, ornamental plants, perennial plants, rare plants as well as materials such as fabulous pots and equipment for gardening. Specially, “Suttichorn Soil”, bio-soil is produced by our special and various formulas. We can guarantee that using bio-soil makes plants fertilized without using any chemicals. “We emphasize on quality, excellent service and competitive price”.